Down to the final four, our Catch of the Year bracket rolls on. Two matchups of alliterative adversaries will decide which clips battle it out for the title. The semifinal round of voting starts now and closes on Friday, January 6th, at 12 noon Eastern — a quick turnaround before we move into the finals over the weekend. Don’t believe the hype (#fakenews), the MLU isn’t dead yet! Is keeping this nominee alive the result of an army of MLU fans not yet ready to fully let go… or are we just getting trolled based on my snarky footnote last round? Mehta lives to fight another day and next lines up against a massive world-class effort in a world-class moment. If anyone can knock off Mehta, perhaps it’s Matsuno. As one of the few people who managed to make John Stubbs look mortal in 2016, nothing may be impossible for the Japanese superstar. He’ll be looking to his own stronghold of voters — the international crowd — to carry him to the finals. On Thursday of Club Nationals, Knowles’ layout grab was one of the more talked about moments of the day among those who saw it. Now the wider ultimate community seems to be getting on board that hype train. Can Knowles soar to yet another victory in our bracket? Bethany Kaylor simply cannot be stopped. After a convincing victory over Allison Bashford in the first round, Kaylor absolutely dominated her quarterfinal showdown with Riot’s Shira Stern. Now she’s facing a nominee who has gritted out two tight victories to make it this far. 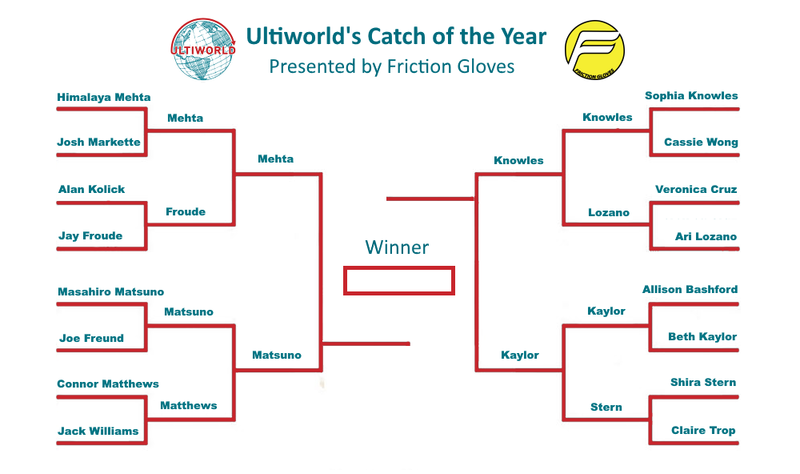 Comments on "Semifinals Of Ultiworld’s Catch Of The Year Bracket, Presented By Friction Gloves"